On October 19, 2016 the University held a regular meeting of the delegation of the University led by the Rector, Professor Nadia Skotna with the delegations of the State Agency for solving alcoholism problems (Warsaw, Poland), led by Director Krzysztof Brzuska and “Caritas” Charitable Foundation of Sambir-Drohobych Diocese, headed by the director Rev. Ihor Kozankevych. 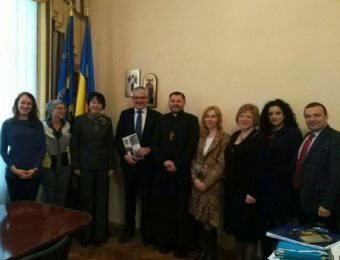 The University of Drohobych delegation included the head of the Department of Law, Sociology and Political science Prof. Svitlana Schudlo, the Dean of Department of Social Studies and Humanities Ihor Hrynyk, lecturer in Applied Psychology Liliya Vovk. During the meeting a tripartite cooperation agreement was signed and joint steps to implement the programs of preventing addictions among young people were discussed. The first step of cooperation will be inquiry of Lviv students on healthy lifestyle, and of young people in Poland with subsequent comparison and discussion of the research results. During the meeting the possibility of integration of youth addiction prevention in educational programs for training in relevant field were discussed. The Polish partners have brought a significant number of the latest professional literature for our library, which will be used by students and teachers in their educational and research work. Note that the Polish state agency is a reputable professional structure that deals with certified training specialists in the field of psychotherapy, expertise, consulting, development of new technologies, research in combating addiction, particularly focused on preventing and solving alcohol problems.